You probably knew that authors like K.W. Jeter helped create the genre of Steampunk, which eventually became the publishing and fashion juggernaut we all know today. But did you know that King Arthur played an important role in the genesis of the genre? Tim Powers explains in a new interview. Maybe you already knew this story, but I'd never heard it before. Talking to Mitch Wagner, Powers talks about the importance of research in his historical fiction. And then he explains how he, Jeter and Ray Nelson got their start — editor Roger Elwood was in touch with a British publisher who wanted to publish "a series of books about King Arthur reincarnated throughout history." Elwood asked Powers, Jeter and Nelson if they were interested in writing books in the series. The three authors divided up history. Jeter wrote about a reincarnated King Arthur in Victorian London, while Powers wrote about Arthur coming back during the Siege of Vienna in 1529. "That project collapsed. The British publisher decided they didn't want those books after all. And we were all three of us left with books about King Arthur at various points in history. 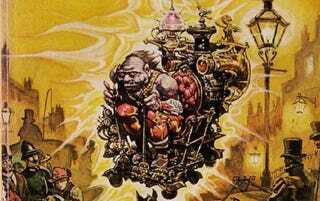 Jeter sold his to DAW Books, which was Morlock Night,and that was kind of the beginning of what was called steampunk. There were other things previously but those weren't called steampunk. "And I, luckily, sent mine to Lester Del Rey at Del Rey Books. Del Rey made me rewrite it entirely, and so I took King Arthur out and arranged the stuff and that that became The Anubis Gates.